VIDEO: Jim McQueeny talk with Dr. Bart Rossi on New Jersey News 12 Power & Politics about NJ Assembly Speaker Sheila Y. Oliver her potential upcoming political battles. 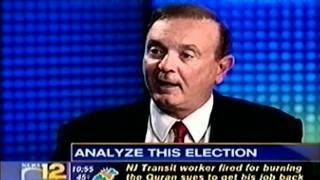 Brian Jenkins talks with Dr. Rossi on New Jersey channel 12 News: Power & Politics to discuss President Obama’s approach to the issues of the day vs. the problems American’s are facing. Is he too intellectual? VIDEO: Do people vote for a candidates characteristics, or for the views they stand for? Steve Kornacki interview's Dr. Rossi about the issues that draw voters to particular candidates.